If you're a nail technician, I would love to here from you. Send me answers to the following questions and I'll publish a post about you. Great way to get people to know you and promote your services. 1. How long have you been a nail technician/manicurist? 2. Where do you work and what services do you offer? 4. What is your favorite nail color? 5. What brands do you recommend? 6. Provide a tip about applying nail polish, maintaining beautiful nails, or any other nail tip worth sharing. If you have a picture of you or your business logo, send it over as well and I'll include it in the post. To submit your answers fill in the following form and I will contact you shortly after. At that point, you can e-mail your pic if you wish. 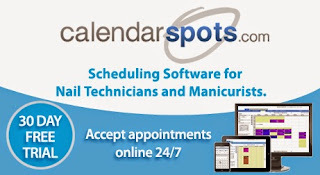 Calendarspots.com's flexible online appointment booking software can save you time and fill up your appointment book. Start your free 30-day software trial today.